Walking up to the bar, you can see that the ‘brand’ has had a bit of a revamp. This is shown in the colours that are adorning the new signage outside, as well as the barriers of the seating area. It has a real modern and clean feel to it, with the colours being white and green. I can’t quite remember if the green backlighting changes colour, but the white and green definitely fit in with the newer decor inside the bar. The glass front of the building has been a big feature along Park Row for many years, and this has remained predominantly unchanged in the revamp. I like that the bar has this glass front as it allows in loads of natural light as well as giving you the chance of people watching (and who doesn’t love doing this?). 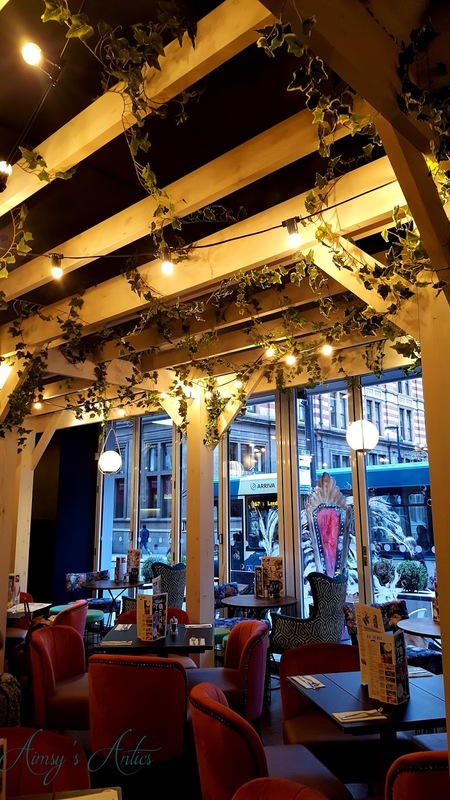 So, as you walk into the bar, the large window is to your right with a newly added ‘pergola’ type roof with trailing foliage giving this area a bit of an ‘outside-in’ feel. I really liked this look as the wooden beams are a glorious white with the contrasting green of the leaves trailing and draping over them, giving it a really fresh look. There is a booth near to this area which follows the plant theme, with the wall art being several white plant pots with green-leaved plants inside. This really ties it in with this area of the bar. We were shown to our seat by a lovely member of staff, with the reserved sign being in the form of a picture frame with all the details of the booking. From where we were sat, we had a brilliant view of the bar, which has also been revamped slightly in the remodel. From here we could also see further artwork that had been added, as well as very in marble patterned walls (a blogger’s dream!) one with artwork and the other adorned with glistening mirrors. I would not like to be the person that has to clean all of those! 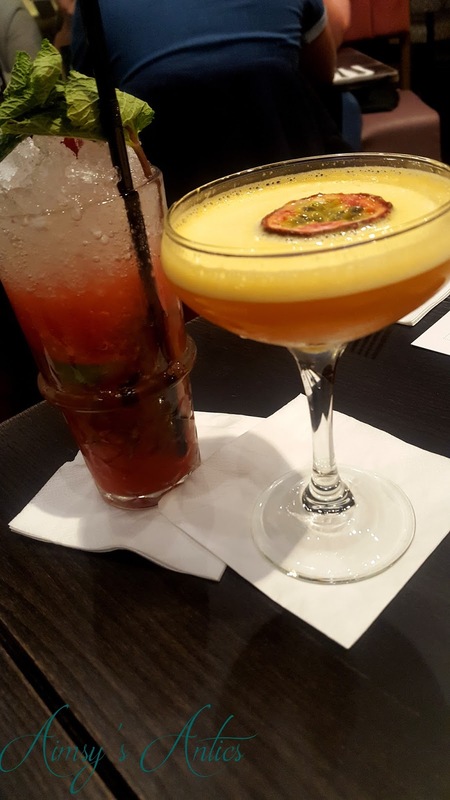 We had had a look over the vast cocktail menu, which is 2-for-1 when you order two of the same, deciding on a strawberry mojito and passionfruit daiquiri (2 each). 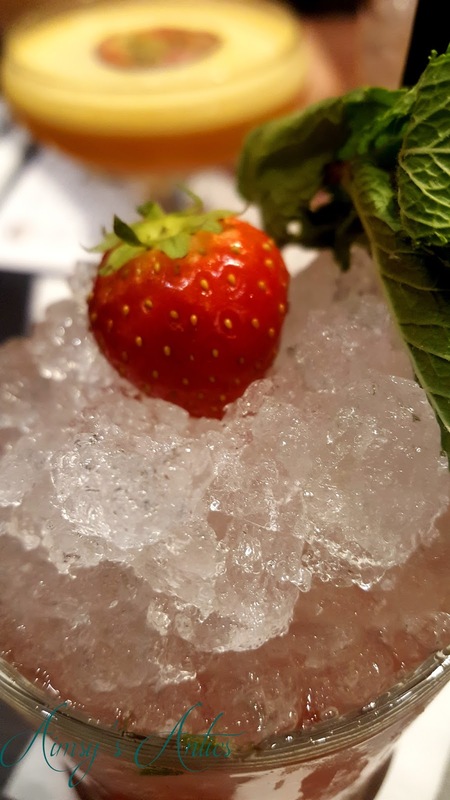 These were lovely and refreshing and packed a great punch. After choosing our drink we went onto the food menu, which appears to have shrunk inside. We were informed that this was a lunch menu and that there were more choices available on the evening menu. This wasn’t a problem at all as it really helped make a decision on what to eat. I find if the menu is too big that I really struggle to decide on what to eat. I have also been informed that there will be a new menu launching in the next few weeks so there may be different dishes on offer the next time we visit. We chose to have a try of the ciabatta sandwiches, choosing Halloumi and Avocado, and Rump steak. Both were delicious and with the added chips filled our bellies well. We didn’t try any of the desserts but saw a few being brought out of the kitchen which looked delicious too. We decided to have more of a liquid dessert – Espresso Martinis, which again were delicious and strong! 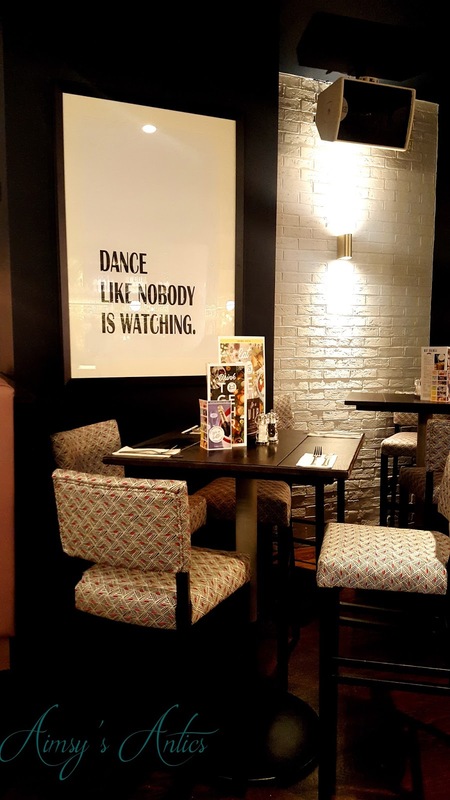 So after we finished our food and drinks, we had a little nosey around of other newly decorated areas. 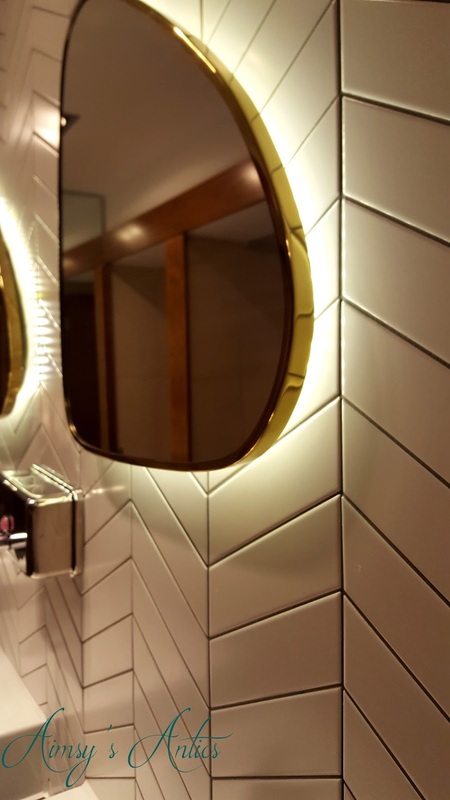 The white tiles covering the columns in the bar were continued into the toilets, where new backlit mirrors were placed. There is also a grand mirror hanging on the wall on the stairway to the toilets, which I think is beautiful. Continuing our nosey around, we ventured into the ‘snug’ area. this has been transformed from a separate dining area to the area where cocktail master classes will be held. The decor is bright in this part, with patterned wallpaper and a neon cocktail sign. 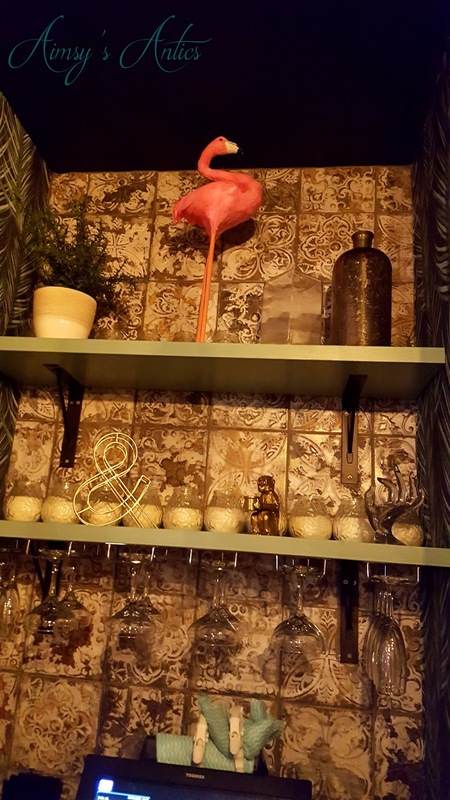 There is a large table in middle set up for the classes, with the alcoves being decorated with glassware and various pieces of artwork, one being a large pink flamingo. 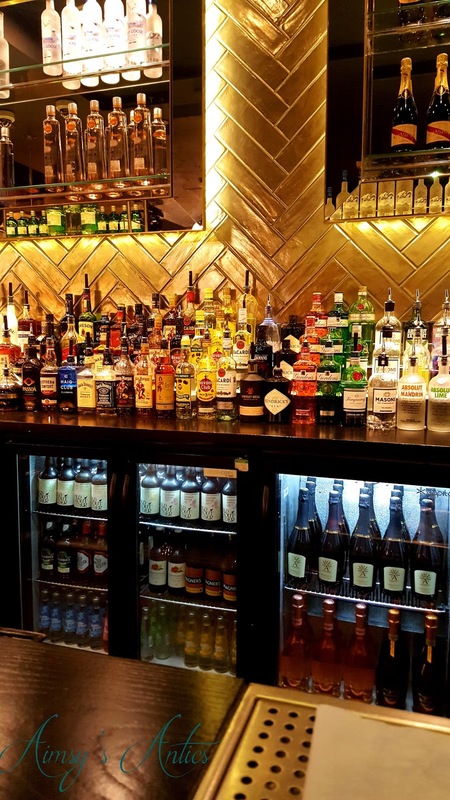 There are a few different cocktail masterclasses to choose from; two of which being £25pp pounds, which include learning how to make two cocktails, shared buffet and a choice of ‘bomb’. 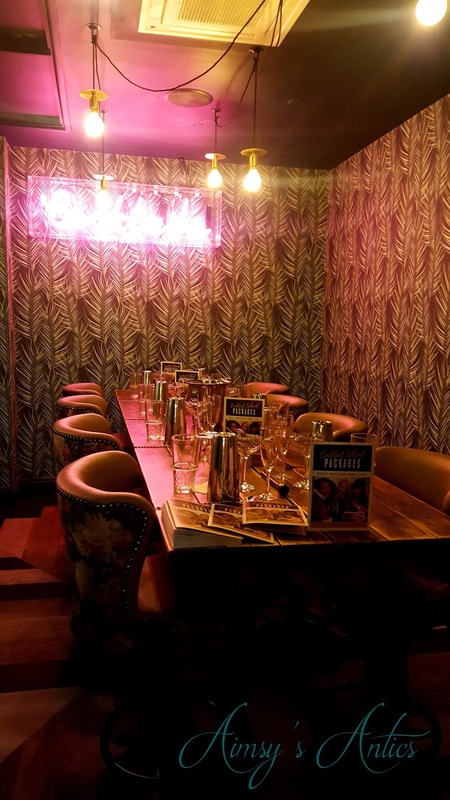 The next type of masterclass is £30pp and is for sparkling cocktails (prosecco based) with a shared buffet and ‘bomb’. All can be upgraded to a more sit down meal of two or three set courses. these would be fab for some kind of girls/boys night out like a birthday or hen/stag party. 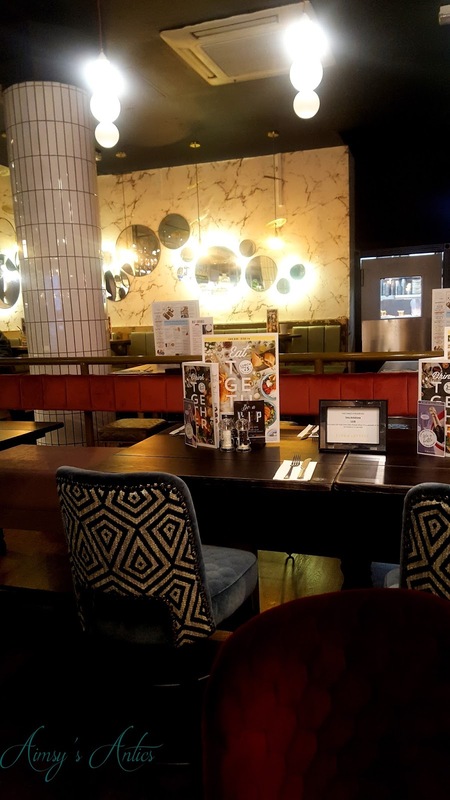 Personally, I think the bar has a very art deco feel to it in some places, which I love, and I think the re-vamp looks brilliant. I am looking forward to visiting again to try more food and drink from the menus. 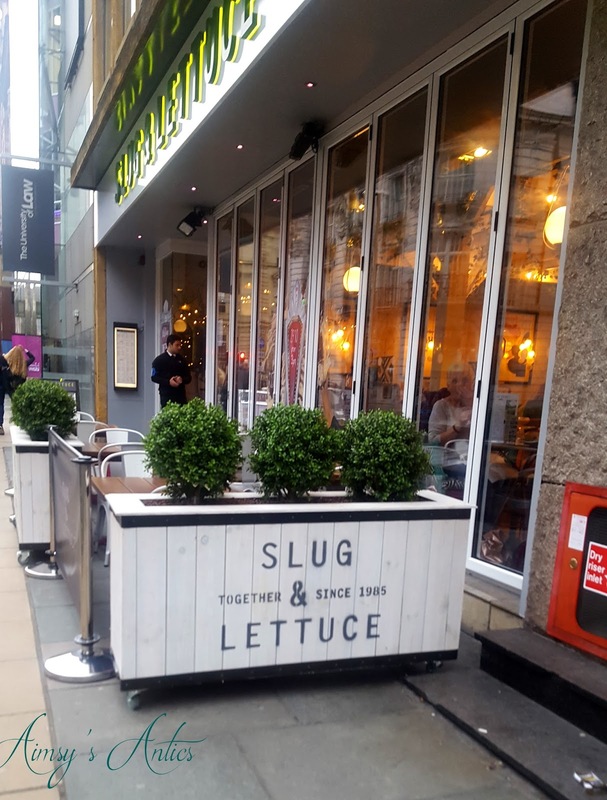 So there is my sort of review on the newly revamped Slug and Lettuce in Leeds. Have you visited here before? What do you think of the decor?